Good morning! 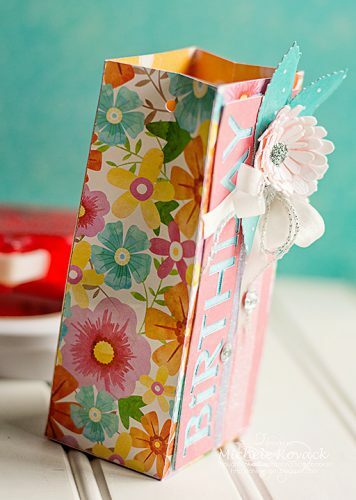 Michele here with a birthday bag that is perfect to fit a small sized gift or gift card! To WEAR YOUR ADHESIVES ON THE OUTSIDE, I accented the bag with glitter and our Premium Double-Sided Tape in a combination of sizes for that fabulous sparkle! What do you think? Die-cut bag die from manual die-cutting machine. Adhere sides with Dual Tip Glue Pen. 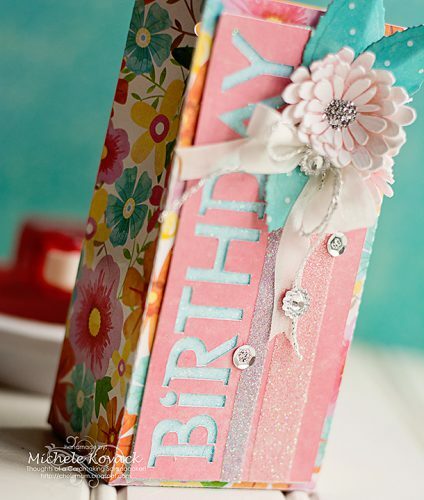 Use two layers of Premium Double-Sided Tape 1″ (under BIRTHDAY). 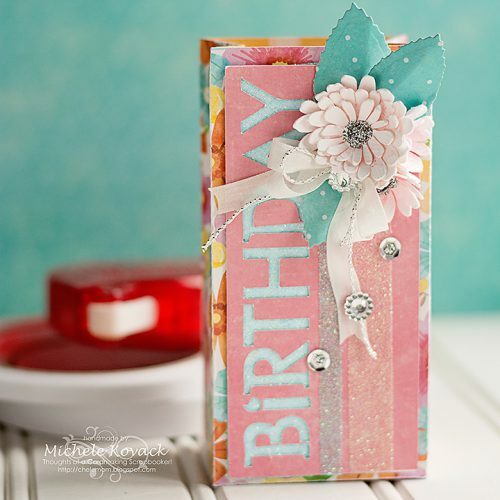 Sprinkle light blue glitter and attach pink panel to the front. For extra interest, add Premium Double-Sided Tape 1/4″ and Premium Double-Sided Tape 1/2″ vertically. Sprinkle light blue to the Premium Double-Sided Tape 1/4″ and clear coarse glitter to the Premium Double-Sided Tape 1/2″. Die-cut leaves and flowers dies from manual die-cutting machine and layer them using Adhesive Dots Medium. 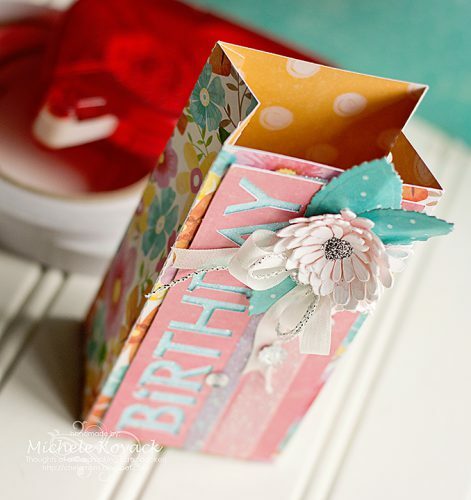 Tuck in silk ribbon with silver string under the flower with another Adhesive Dots Medium. Add rhinestones and sequins using Adhesive Dots Mini to secure. Adhere the entire pink panel to the box with the E-Z Runner® Permanent Strips. This was such a fun birthday box to make! This entry was posted in 3D Projects, Adhesive Dots & Lines, Adhesives, Crafts & Tutorials, Crafty Power Tape, E-Z Runner® Dispensers, Gifts, HomeHobby by 3L, Intermediate, Permanent Adhesive, Premium Double-Sided Tapes, Skill Level, Tutorial, Wear your Adhesive on the Outside and tagged Adhesive Dots Medium, Adhesive Dots Mini, Adhesive Essential Kit, Adhesive Value Pack, Dual Tip Glue Pen, E-Z Runner and E-Z Squares Combo Value Pack, E-Z Runner Combo Value Pack, E-Z Runner Permanent Strips, E-Z Runner Permanent Strips Refillable, E-Z Runner Permanent Strips Refillable Value Pack, Gift Box, Glitter, Michele Kovack, Premium Double-Sided Tape 1", Premium Double-Sided Tape 1/2", Premium Double-Sided Tape 1/4", Tutorial, Wear Your Adhesive on the Outside. Bookmark the permalink.